I've left a review from past visits, but there's been a change to Eagle Hammock, one that I don't like. In the past when we've arrived after hours, there used to be a folder with our name, site #, map, and general base information in it. The site would even be circled. A note on the check-in booth included instructions on checking in with the duty host. However, they no longer do that. I had to wake up the duty host (it was around 10:30pm). At first I was confused because a sign on his camper said he was over at the rec room facility, but it was after hours. I knocked on the camper and got no answer, so I went over to the rec room - as I thought it was locked and dark. Went back to the host's camper and knocked louder - that woke him up. He had me sign in and told me my site numbers (we were traveling with my son-in-law and daughter who had their own camper). I immediately questioned one of them because it was across from his site and all of the "B" sites were full. Long story short, someone had come in around 8pm, didn't check in with anyone, and just took the empty site (the campground was overfull with at least half-a-dozen campers in the grassy areas). It took four attempts to rouse the owner of that RV. He actually argued with the host over having to move. I finally stepped in and told the owner that I paid for that site over a month ago and he'd better move now or I'd call the base police. He relented and packed up his RV (got death glares from his wife the whole time!). I then asked the host to check on my other site to make sure we didn't have a repeat. Fortunately it was empty. 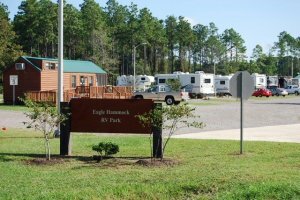 As in past stays, the campground is immaculate, very up-to-date, and the best value of the dozen other military campgrounds we've stayed at. Just wish they'd go back to the after-hours check in - so much easier. The host said they stopped doing that due to personal information regarding the camper. I can't quite grasp that as the only personal information on the folder was just my last name.